Here’s a quick breakdown of these three major types of speed workouts. Fartleks, That’s fun to say. Elf. Hi, Mary. Thanks for the kudos. Ask and you shall receive: Here is a brief 411 on fartlek, tempo, and interval workouts. Fartlek Workouts are not only fun to say out loud, but they’re fun to run. 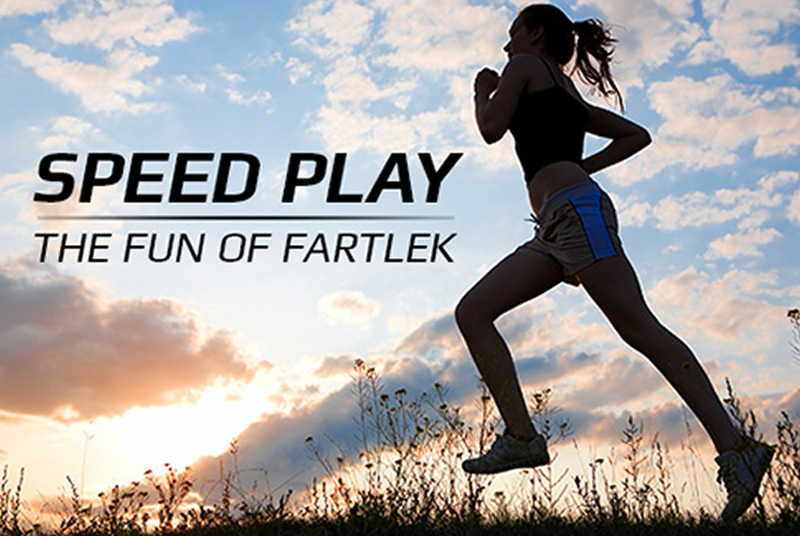 Fartlek is Swedish for “speed play,” and that is exactly what it’s all about. Unlike tempo and interval work, fartlek is unstructured and alternates moderate-to-hard efforts with easy throughout. After a warmup, you play with speed by running at faster efforts for short periods of time (to that tree, to the sign) followed by easy-effort running to recover. It’s fun in a group setting as you can alternate the leader and mix up the pace and time. And in doing so, you reap the mental benefits of being pushed by your buddies through an unpredictable workout. The goal is to keep it free-flowing so you’re untethered to the watch or a plan, and to run at harder efforts but not a specific pace. Benefits: Stress-free workout that improves mind-body awareness, mental strength, and stamina. Tempo Workouts are like an Oreo cookie, with the warmup and cooldown as the cookie, and a run at an effort at or slightly above your anaerobic threshold (the place where your body shifts to using more glycogen for energy) as the filling. This is the effort level just outside your comfort zone—you can hear your breathing, but you’re not gasping for air. If you can talk easily, you’re not in the tempo zone, and if you can’t talk at all, you’re above the zone. It should be at an effort somewhere in the middle, so you can talk in broken words. Pace is not an effective means for running a tempo workout, as there are many variables that can affect pace including heat, wind, fatigue, and terrain. Learn how to find your threshold and run a tempo workout that is spot on every time here. Benefits: Increased lactate threshold to run faster at easier effort levels. Improves focus, race simulation, and mental strength. Interval Workouts are short, intense efforts followed by equal or slightly longer recovery time. For example, after a warmup, run two minutes at a hard effort, followed by two to three minutes of easy jogging or walking to catch your breath. Unlike tempo workouts, you’re running above your red line and at an effort where you are reaching hard for air and counting the seconds until you can stop—a controlled fast effort followed by a truly easy jog. The secret is in the recovery as patience and discipline while you’re running easy allows you to run the next interval strong and finish the entire workout fatigued but not completely spent. Just like rest, your body adapts and gets stronger in the recovery mode. Benefits: Improved running form and economy, endurance, mind-body coordination, motivation, and fat-burning. You can ask Coach Jenny a running question on the Ask Coach Jenny Facebook Page or email your question here. Follow her on Twitter @coachjenny.